“As a marketer, you really have to prove the value you're adding to your organisation – in terms of numbers," says Margie Agin, director of online marketing at Tandberg. In an age of increasing accountability, marketers need to measure and demonstrate the impact that marketing has on driving revenue. 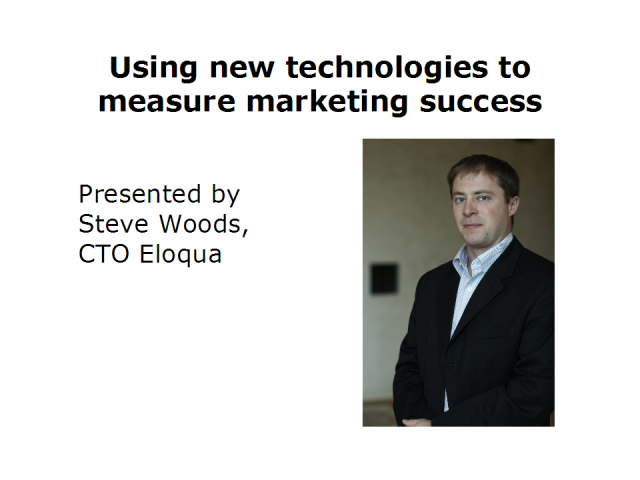 Steven Woods of Eloqua, as he explores tactical and strategic marketing metrics. You will come away with a roadmap for building an analysis framework of your overall marketing effectiveness. · How to measure the success of individual marketing campaigns. · Ways to analyse your database’s level of interest and engagement. · Board level approaches to presenting key marketing metrics.